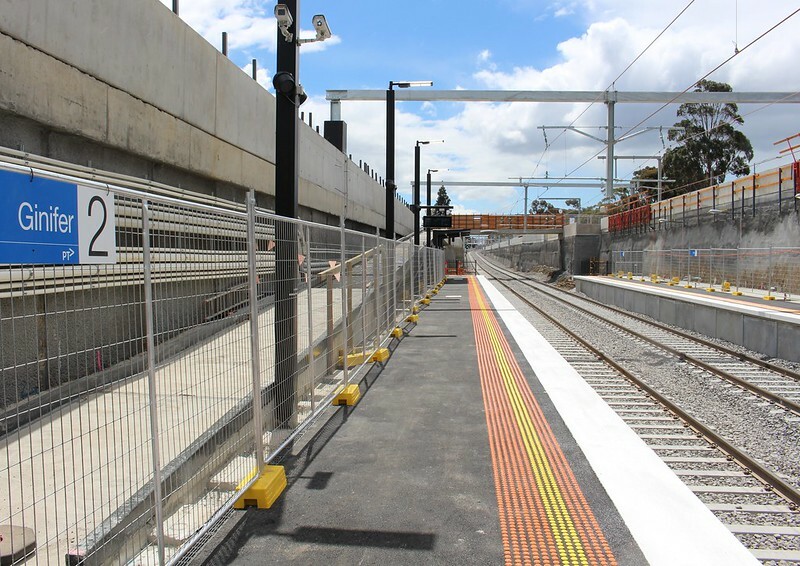 The level crossing removals at Ginifer (Furlong Road) and St Albans (Main Road) are nearing completion, and yesterday the new stations opened. 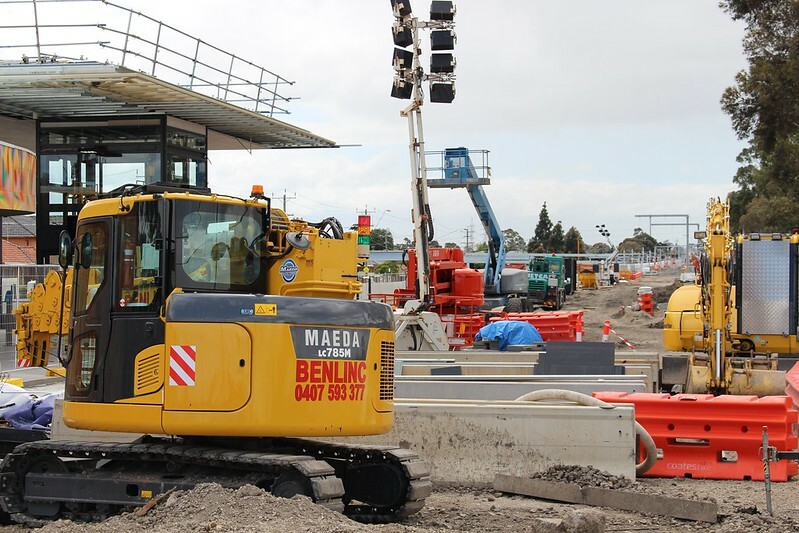 Originally the plan had been to remove the St Albans (Main Road) crossing — this was funded by the Coalition government in 2014, for a massive $200 million, recouped from savings during the Regional Rail Project. When Labor came to power in November 2014, they added the nearby Furlong Road crossing to the list, making it part of a $481.2 million package that also includes crossings at Blackburn and Heatherdale — packaging the four together appears to have brought the cost down. 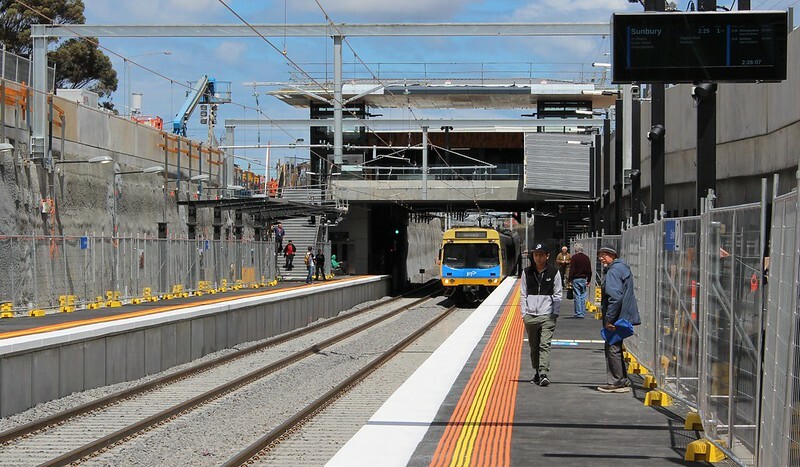 Importantly, the Main Road and Furlong Road level crossings were the ranked most dangerous in the 2008 ALCAM list, after those at Nunawading, Springvale and Mitcham (all since removed), so these grade separations are very welcome. The re-opening of the stations was not without some confusion. 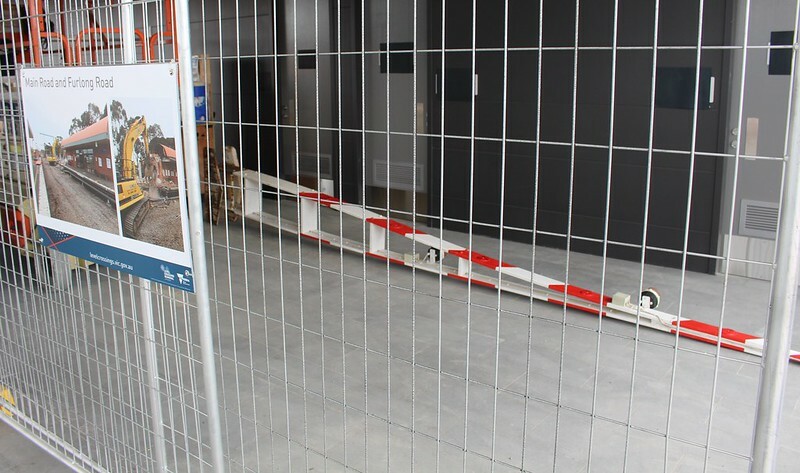 Originally the line and stations were to open first thing Monday, but there were (understandable) delays with the work due to bad weather last week. Then they said everything would open first thing Tuesday. But there were more delays. By Tuesday morning, they were saying that Metro services would resume at 2pm. 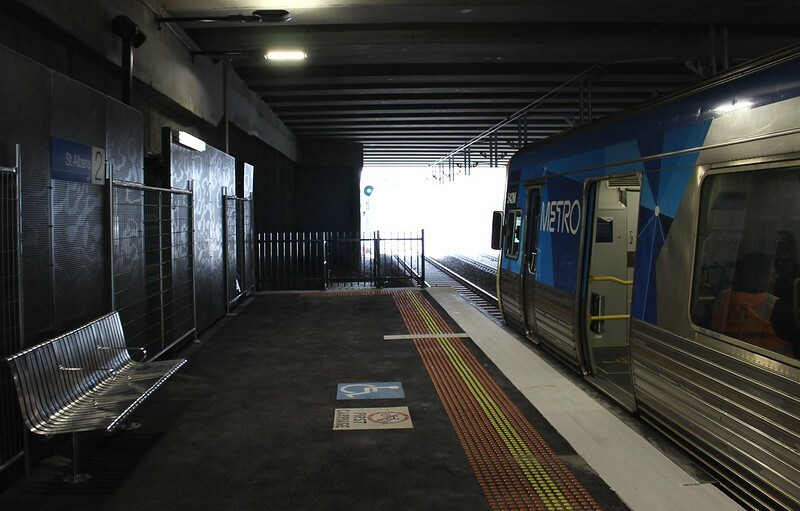 V/Line were saying their trains would resume at 10am, and PTV were saying that V/Line’s trains would resume on Wednesday morning. What actually happened was that trains resumed at about 9am. 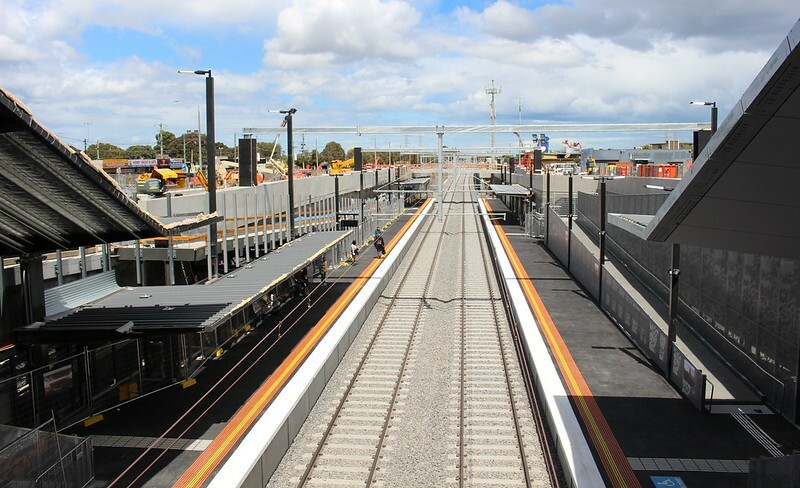 Sunbury line: Train services have now resumed between Sunbury and Sunshine after the completion of @levelcrossings project works. I took a look on Tuesday afternoon. Not being a local, I’d wondered for ages if Ginifer is pronounced with a soft or a hard “G” — according to the automated lady on the Siemens train I caught, it’s a hard G.
Being Cup Day, there weren’t a huge number of people around. The confusion over the opening time may have prevented any fanfare as occurred at Mckinnon, Ormond and Bentleigh when they opened. 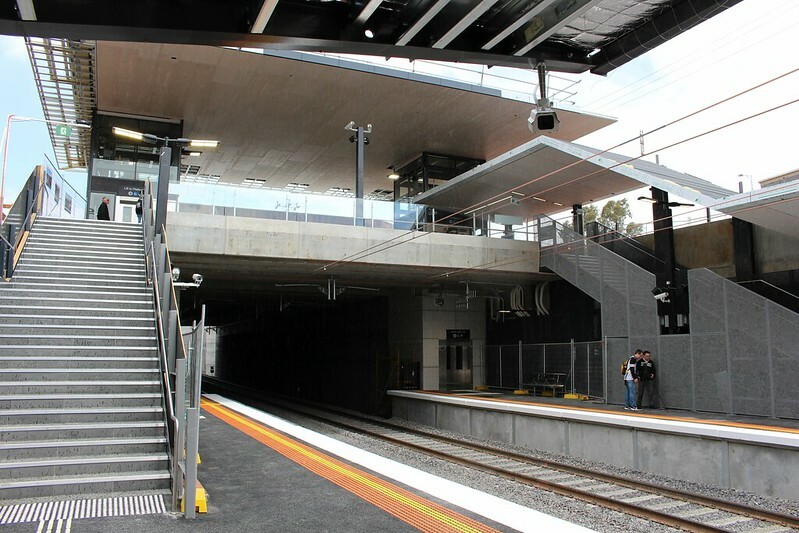 There are currently stairs from the concourse, which is at the southern end of the station. Lifts are there as well, and I think they were working, but didn’t see anybody using them. 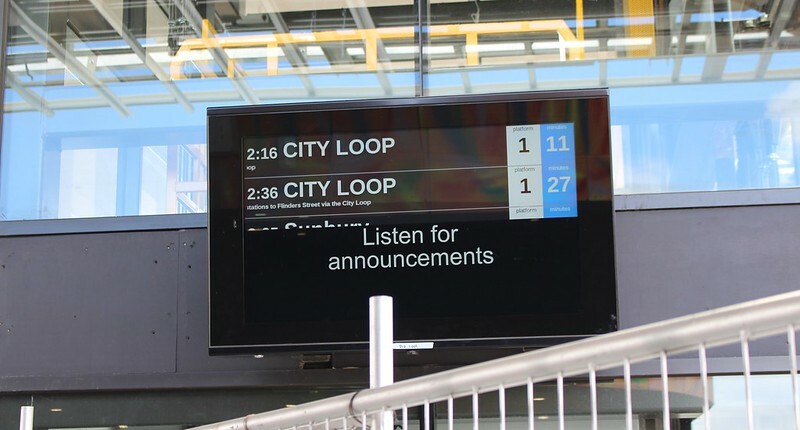 The concourse and platform screens weren’t quite working, but will be handy once operational. It’s an unstaffed station, so there are standalone (old, slow) Myki readers on poles. Some areas are fenced off. Behind one fence on the concourse I found an old boom gate. Waiting for an official ceremony/opening? You can see the old rail alignment, on the eastern side of the new station trench. 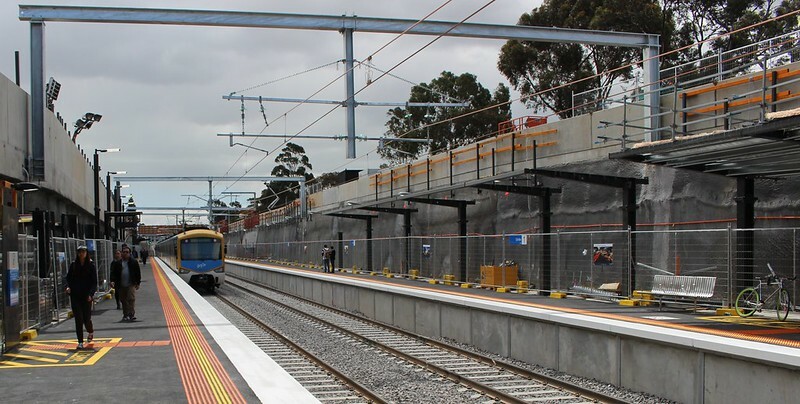 Given V/Line trains also use this section, one would hope this will be kept free of major structures, to allow future track expansion, as at Springvale. There’s not much rain cover at present. The “up” (citybound) platform looks like it will get a fair bit of cover, perhaps about half the platform, but it’s less clear how much the “down” (outbound) platform will get. 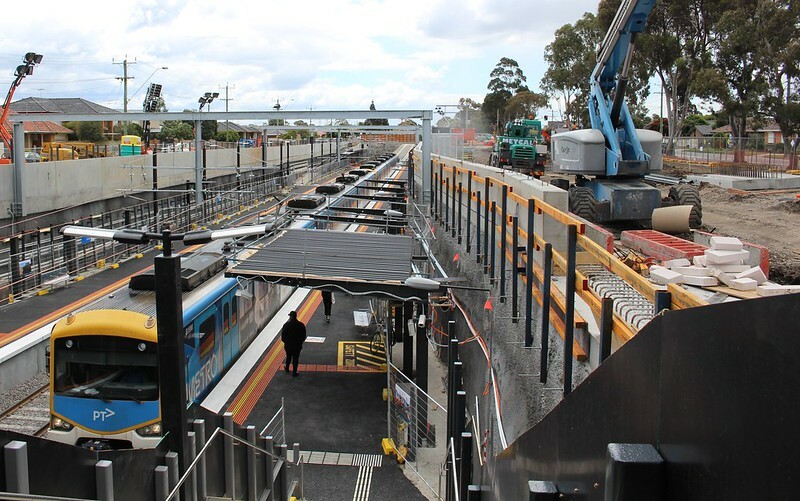 At the northern end of the station, ramps are under construction, providing more access from that end, and also a handy backup if a lift breaks down. There also seems to be a little bit of space to extend the platforms — though it’s unclear if there’s enough space to cater for the planned longer trains without having to extend the trench. Lifts were in operation, and lots of people off my train decided to use them. There are also ramps and stairs, all of which go to the one concourse at the northern end. 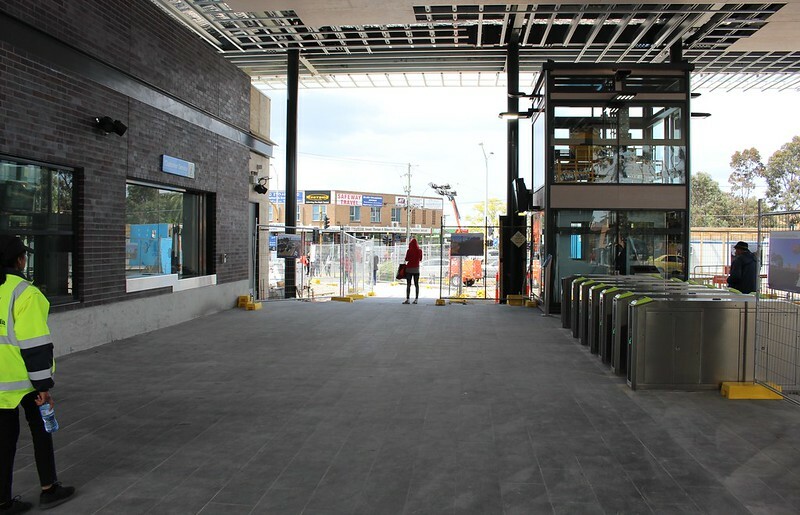 Myki gates (with the new Vix readers) are in position on the concourse, which covers the northern end of the platforms. Again, there’s a bit of temporary fencing around, so clearly there’s a bit of work to do yet to complete it. 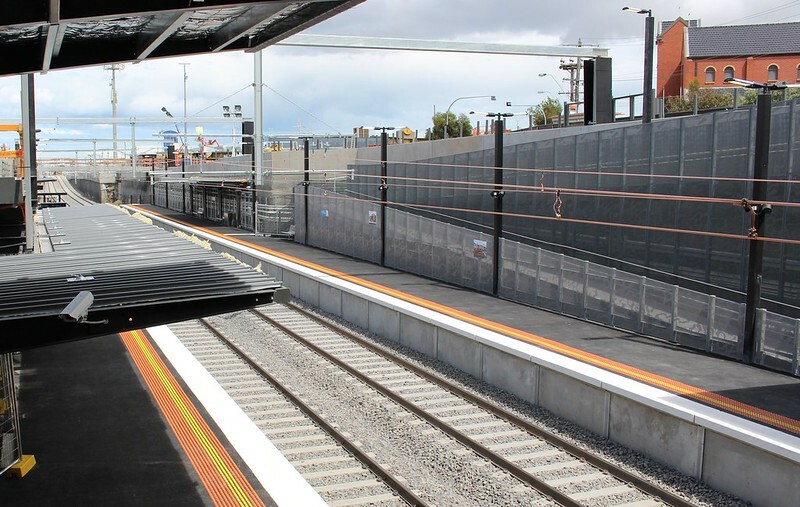 But it’s great to see these dangerous crossings removed, and the new stations opened. Like you, I live on the other side of town so haven’t seen the progress of this removal. Thanks for the pictures. Quite amusing that VLine can say one thing and PTV say another – One does get the impression sometimes that the folk who run our transport don’t talk to each other. Prior to the level crossing removal, I have waited up to ten minutes to get across the tracks even in the evening at 8.45 pm . 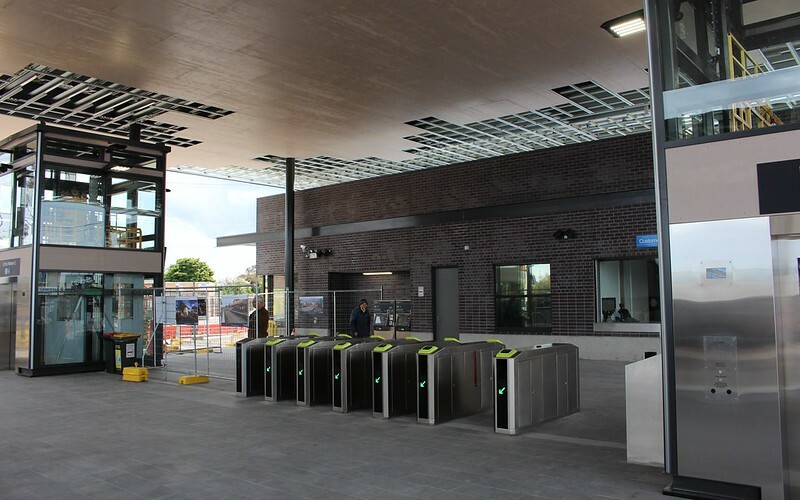 The removal is welcomed and the new station a vast improvement in both amenities and location. So V/Line was right and they don’t even stop there. 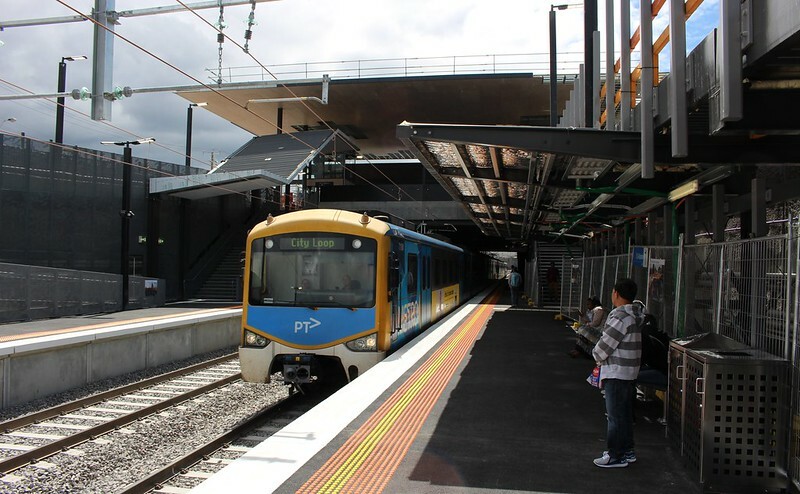 Re relations between V/Line and PTV: a nicely understated comment a few months ago from a PTV staffer was “we are having difficulty getting V/Line to buy into the concept” (of an overall planning & management body). Maybe that’s part of the reason why V/Line HQ was moved into shared premises with PTV a few years ago, but the osmotic effect seems to be very slow! Thanks for the photos. I used to travel through Ginifer and St Albans stations a few times a week last year but not so much anymore. Did you spot the inclusion of a waiting room at Ginifer? The old station had an indoor waiting room with seating, a vending machine and (locked) toilets. Alas, I doubt the new station got one considering it’s unstaffed. Good of you to note the off-peak and weekend frequency on the Sunbury line! Interesting to note that the carpark at Sunshine that was being used as the replacement bus staging area was only half full at 9.30 this morning – maybe commuters not quite back to normal routine yet. One thing that isn’t highlighted enough with the new Ginifer is moving the station south by about 200m, which brings it closer to Sunshine Hospital, an important win (previously some people took the zig-zagging 408 all the way from Sunshine than the 650m walk). The northern entrance is effectively where the old ped crossing was. And some people say level crossing removals have little benefit for PT users! Thanks Daniel, I’m posting my comment from another country and seeing the stations St Albans & Giniger (ok, with a hard G) changing so much. Love to come back this xmas season. The whole Labor vs Coalition who funded it argument is kind of insulting since the taxpayers of Victoria really funded it. I grew up in St Albans. The new Ginifer station looks nothing like the one I remember. To be fair the stations are still in construction mode. There are plenty of exposed ducts and only a limited amount of sitting. There’s probably about half a year’s worth of works to go.